We shape our God, and then our God shapes us. Bell speaks of what I used to often call the "God of our understanding." The idea is that we all have an idea, image of God and that that image does not necessarily line up with the "God of reality." Bell, though, is less quick to speak of a "God of reality" and instead focuses on how our God shapes much of our beliefs about God, life, others, etc. For, at the heart of it, what we think about God, how we paint the picture of God, determines how we live our lives, how we justify our actions or inactions, to whom we decide to lie and to whom we decide tobe truthful. I too, am much less inclined to speak of a "God of reality" these days, not because I don't believe in God, but because I think we are destined to only ever have a "God of our understanding." I do think there are certain concepts that should never be assigned to "God" and certain ones that must always be used to describe "God," but I make no claim to be speaking ontologically about God. I'm merely speaking of God as I understand God, as I have experienced God, as I believe God. This is not to say that it does not matter what we believe about God. On the contrary, our beliefs matter. They matter for how we live our lives, how we treat others, how we choose to examine our lives, if and how we serve others, etc. Our beliefs about God, the world we live in, ourselves, humanity, nature shape who we are and the life we live. Our beliefs matter. That is why it is so important to seriously think about how we shape God and the implications of the God we shape, because "we shape our God, and the our God shapes us." 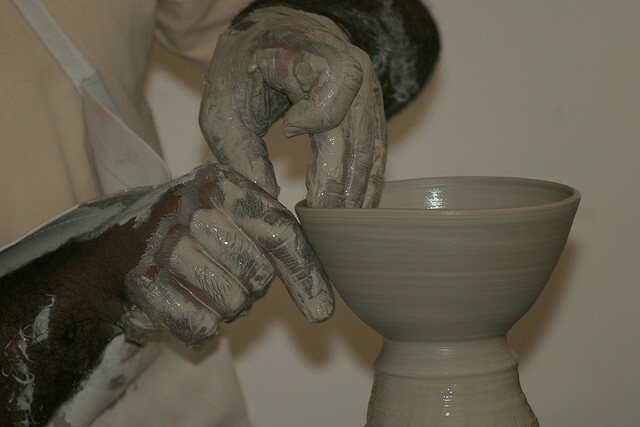 Credits: "Potter's Hand" by Anduze Traveller is made available under a Creative Commons license.